I’m always on the lookout for images to use for inspiration in my writing, especially when it comes to writing descriptions of Regency era clothing. This, I thought, is a very nice linen gown, perfect for a warm summer day; and it has some lovely embroidery along the neckline and on the hems of the sleeves and skirt. The shape of the gown appealed to me, too, because the extra fabric gathered in back reminded me of the “round gown” popular around the year 1800. And the scalloped edges on the hems of the sleeves and skirt were something I couldn’t recall seeing before. And that’s when I realized I wasn’t looking at embroidery; I was looking at beading. Each motif is executed perfectly. In fact, from a distance, you would think it was a machine printed fabric. What’s astonishing to me is how well preserved the gown is; after two-hundred years, every tiny bead is still in its place. I just love this gown because it’s so deceptively simple with its plain linen fabric, but after spending some time looking at the exquisite bead-work, I have to wonder if this wasn’t a very expensive gown to purchase. Even more, I wonder about the talented woman (or women) responsible for creating such a lovely gown. Their skills are a lost art! I’m an American fascinated with all things British, especially manor houses. In my Yankee mind, every English country house has a butler, a stable full of horses, and an ominous-looking suit of armor standing guard in the hall near the front door. While browsing through The Metropolitan Museum of Art collections, I came across this eighteenth century helmet and shield, and all my previous fascinations with battle armor went out the window. It’s gorgeous! No clunky, clanking armor here; just beautiful design, plenty of gilt, and a deep blue patina that makes every beautiful detail stand out. This kind of armor was symbolic, rather than functional. Its design was based on Classical themes that remind me of Greek and Roman heroes. It’s also the kind of armor that was created to impress all who saw it. Very probably it graced an important place in a grand castle or estate, in the same way we’d hang a Monet or Rembrandt so it could be viewed and admired. Thanks to this display at The Met I now have an entirely new take on armor, and a new bit of inspiration to use when I want to imagine the luxurious interior of a great English country house. If you’d like to know more about this helmet and shield (as well as other armor on display), follow this link to The Met’s website.
. . . not romances nor are they historical fiction. So, how do we Janeites describe her novels to someone who has never read them before? 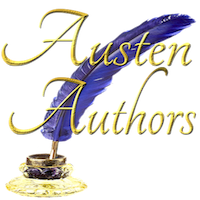 I’m tackling that question on the Austen Authors blog today. Please click on the link below and share your opinion! For the past few weeks we’ve been in a deep-freeze in Colorado. Before going outside I have to bundle up in multiple layers of clothing, before I don my warmest coat, gloves, and hat. I may not look very stylish; but under the circumstances, I’m much more interested in being warm than fashionable. Not so for the gentlemen pictured in this post. They’re dressed to meet the winter elements while still maintaining a strong sense of Regency style. Their coats appear to be made of different types of wools, while their coat collars are fashioned from velvets and furs. In our modern times people don’t wear fur. We have the technology to create fabrics and garments that insulate us from cold, so we don’t need to rely on animal hides for warmth; that wasn’t the case for people who lived through in the late 1700s and early 1800s. What I like about these images is that I can sense the weight of the garments these gentlemen are wearing. They look pretty substantial—like they might have some weight to them. I also think the luxurious fabrics and furs serve as a visual reminder of each gentleman’s wealth and stature; not everyone could afford to wear fine furs. John Arthur Douglas Bloomfield, 2nd Baron Bloomfield, 1819. These images are part of my collection of men’s wear illustrations; I refer to them when I want to generally describe a gentleman dressed for a cold winter’s day in England . . . . which, I’m beginning to suspect, feel very similar to a cold day in Colorado! The title of this piece is “The Honeymoon.” I rather like the romantic setting, as the newlyweds relax together on a grassy slope beside a gentle brook, while a pair of swans glide by. 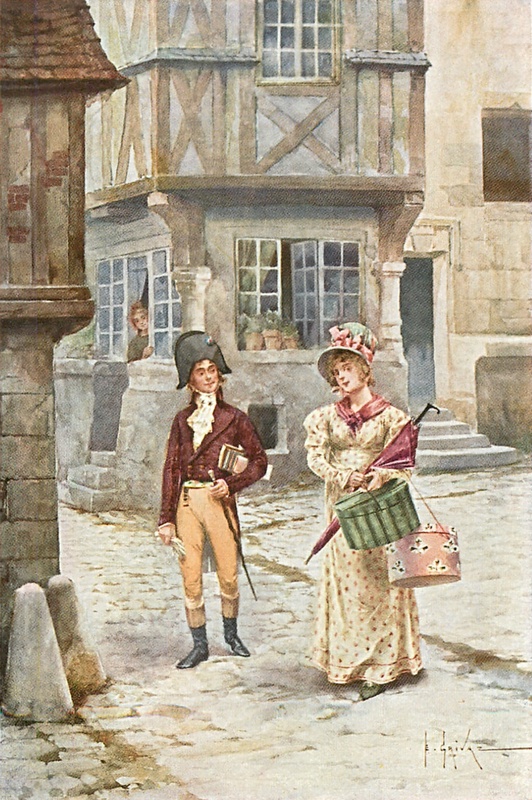 Do you suppose the gentleman is reading poetry to the lady?